After moonlight comes, that is the time when everything happens. Rival Gaming know this, and they have found a way to let us play detective whilst spinning the reels to lots of lovely cash prizes. The bonus features here are nicely thought out, and I enjoyed the music which deepened the plot behind my reason for playing. 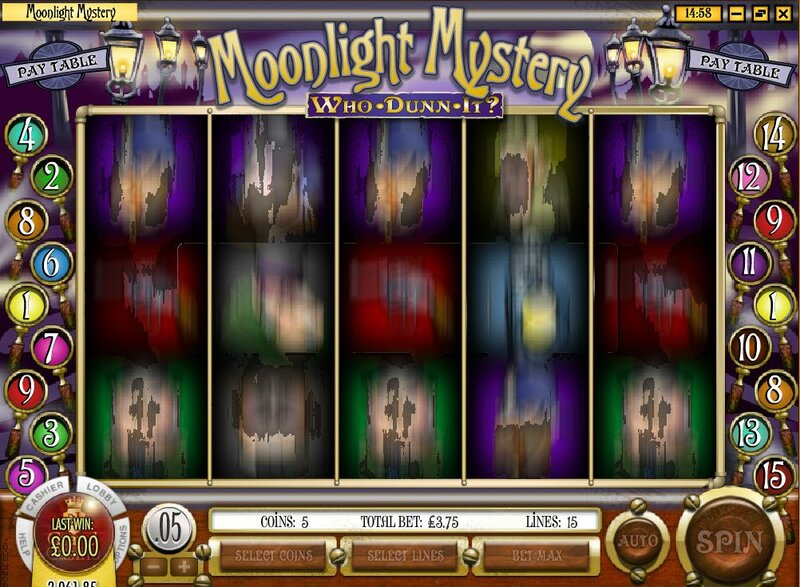 Steeped in mystery, shrouded in darkness, Moonlight Mystery slot is a deeply disturbing offering from Rival Gaming. With an introductory video that will have you quaking in your boots, complete with dark, booming chords preparing you for the tense high pitched tingling music to come that will accompany you through your reel spinning. Is that the occasional bat I hear, thumping through the strings? I must admit, whilst Rival Graphics are sometimes chunky and unappealing, the music is 90% of the time like ear candy. There is always a nice surprising tale in the video sequences, despite being cartoonishly drawn, it does draw you in and prepare you for the mood of the game you are about to win coins on. We do not find out who the mysterious shadowy figure is, but it is to be our intrepid Moonlight Mystery Slot bonus symbol that will take us to the nifty bonus feature. In the beginning, a dark clock-tower stands and the clock strikes 3am, a gun goes off and blood covers the glowing clock face, wiped away by the hands of the clock to reveal clouds going past and, our hero - a veritable Sherlock Holmes, complete with funny hat. As we spin our Moonlight Mystery slot reels, the twinkling of the music increase pace, leaving us breathless to know the outcome, what character will it be? What have we won? The symbols double as suspects in this mystery "Who Dunn it" and are neatly lined up in their ranks. There is The Butler, the Maid, The Professor, The Constable and, then comes Lady Dunnit, Col. Dunnit, The Doctor and The Inspector. 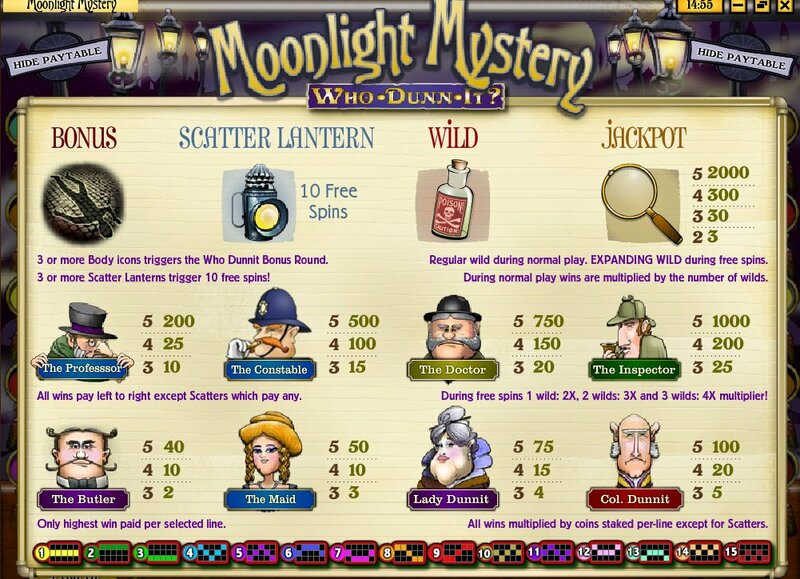 The scatter lantern, a must in these days of old when you need to see your way to solving a crime will award you 10 free spins and, the bottle of poison (perhaps a back-up to the gun that was used in the video introduction) is our wild symbol that expands during free spins to give you even more coins. 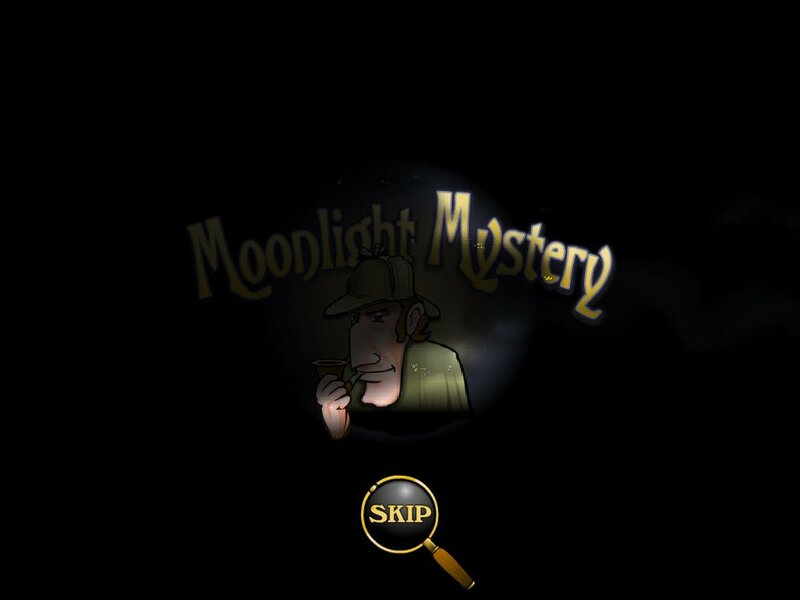 The ever present magnifying glass in sleuth novels and folklore surrounding this old fashioned time period will give you your Moonlight Mystery slot jackpot of 2,000 coins. We do not find out who the mysterious shadowy figure is, but it is to be our intrepid Moonlight Mystery Slot bonus symbol that will take us to the nifty bonus feature. You will play detective and select the scene, weapon and prime suspect in a murder. Payment is right on target for this exercise.